It is situated in Sirkeci, at the junction of Ibni Kemal and Hoca PAsa Roads. The original name of the mosque is Masjid of Hoca Uveys. It got its name from the Hoca Uveys bin Kevser who had the mosque built. The construction belonging to the sultanate of Fatih Sultan Mehmet was complated between the years 1580-90. Hoca Uveys had become the Head of Finance during the sultanate of Sultan Murat III, later on assigned as the Grand Seignior of Budin in 1585 and had become a vizier since he raised the incomes of Egyptian coffers in 1590. 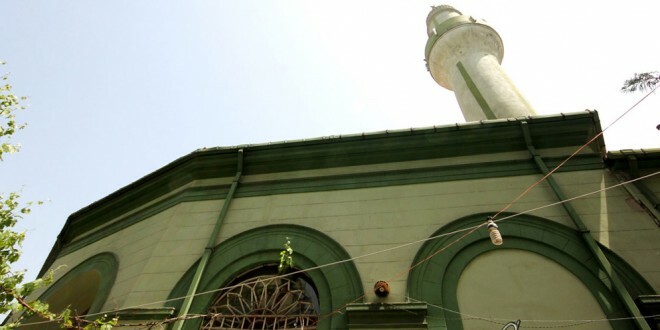 This mosque is thought to have been firstly built at a street on Ebussuud Road. It was complately rebuilt in 1868-69 and thus it carries the architectural features of 19th century. Its mihrab had been renovated in 1964 and embellished with the encaustic tiles of Kutahya. Its single minaret has a thick ground form with a single balcony and stone cone. It is written that the fourth wife of Sultan Mahmut II (1808-1839) had it renovated in the seven-line inscription on the mirror stone of the rococo style fountain, which is located at the right of the entrance gate. Yet the original fountain used to situate right in front of the mosque when it was first built. Hoca Uveys passed away in 1590 and was buried to into the threshold of another mosque he had it built in Egypt.